As the market for Vintage 1960’s Concert Posters is now rapidly evolving, there is often an information lag among collectors as new developments take time to disseminate throughout the marketplace. One of the goals of this weekly blog is to provide a place where collectors can get the latest news and updates about this exciting collectible. Over the past year or two, we’ve seen a bifurcation of the market as the demand for posters in undamaged condition has skyrocketed. By undamaged condition, I mean a poster that exhibits no nicks, tears, pinholes, folds or restoration of any kind. This increased demand has resulted in rising values for the posters have somehow survived the past 45-50 years in undamaged condition. And herein lies the rub. While the “word is out” among most collectors when it comes to top condition, the prices one must pay to acquire such pieces are only known by collectors on the leading edge of the market. Because up until about 5 years ago, there was very little price distinction between damaged and undamaged posters. 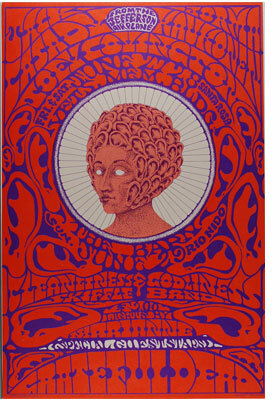 If a poster was worth $4000 in ANY condition, perfect examples, if found, could be acquired for $6000 -$7000. This works out to a 50-75% premium. 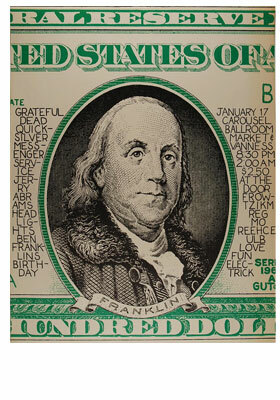 Today, if a poster is worth $4000 in ANY condition, you can expect to pay 12,000-16,000 for a “finest known” example. This works out to a 300-400% premium. So you can see that premiums for the very best condition concert posters are expanding! This situation often proves very frustrating for us when we finally end a years long search for a mint example of an issue and the collector is suddenly taken aback by what we paid and what we need to get for the item. Their brains are still firmly rooted in values and premiums that are circa 2005. While many old-time collectors may consider today’s premium quality values outrageous, the “smart money” knows and understands that this is just the tip of the iceberg. And this is where an opportunity clearly presents itself. A cursory look into other collectibles markets will show you that the finest premium quality coins, stamps, comic books and baseball cards ROUTINELY bring premiums of 20x to 50x the price of a normal surviving example. For example, in January of 2015, I sold the finest known 1793 United States penny for $2.35 million, while examples can be found for just $35,000. The point is, quality never, ever goes out of style and the demand for it continues to grow, as well as the premiums that it commands. So you have a choice. You can turn your back on this trend and ignore it. Or you can embrace this as a lucrative opportunity that has been 50 years in the making. Which will you choose? 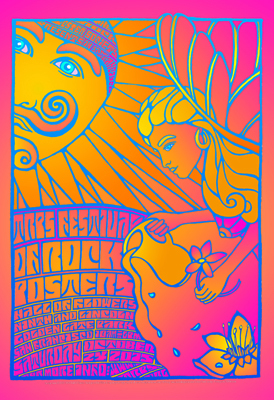 If you are participating in, or plan on participating in today’s market for Classic 1960’s Rock Concert Poster’s, you need to know about 4 major trends that have asserted themselves and seem to be picking up speed and momentum with each passing month. 1) Emphasis on Condition – It’s no secret that the condition, or state of preservation is a main determinant of value in all major collectibles markets. Veteran collectors of coins, stamps, baseball cards, comics and classic automobiles all know that condition is of paramount importance. In classic rock concert posters, undamaged condition, (no pinholes, tape pulls, folds or tears) is especially desirable since the vast majority of these posters were “posted” as advertisements or were tacked up in the homes or crash pads of the youngsters of the era. Those specimens that have somehow miraculously survived unscathed are being voraciously acquired by the “smart money” now entering the field. 2)A Move Away from Restoration and Towards Originality– If one can’t find a particular issue in undamaged condition, the next best thing is an original specimen in un-restored condition. The reason any collectible is desirable and valuable is because it is an original artifact of the era. Once you start adding paper that did not exist, filling holes, etc, you no longer have an original, you have a Frankenstein piece. While there is nothing wrong with owning a piece like this, you can save yourself a ton of money on both the piece and the restoration by just buying a second printing. Stick with originality, and buy the best condition you can find/afford. That’s what the smart money is doing! 3) New Collectors – Ask anyone active in today’s market and they will tell you there are loads of new faces that are now collecting. 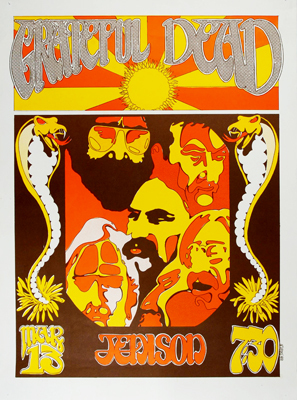 This is a combination of a strong economy, the fact that these posters are now 50 years old, the multitude of recent museum exhibits, the 50th Anniversary of the Grateful Dead,(which got old Dead Heads wanting a real piece of their past) and the fact that all museum quality collectibles are exploding in value. Put it all together and you have a steadily growing snowball of demand that is chasing a tiny available supply. 4) Record Prices – One of the main drivers of the increased demand by the new collectors mentioned above is the perception that museum quality concert posters are severely undervalued in relation to other collectibles. While there HAS been a greater emphasis on condition, you do not see the massive premiums attached to Mint Condition examples that exists in other collectible fields. While it is not unusual for “finest known” examples of other collectibles to trade for 25-50 times a used example, mint condition posters can still be acquired for a very modest multiple of what a used or damaged poster is worth. That’s why you are seeing mint condition examples snapped up quickly at record prices. Because what may seem expensive to an “old timer” in our field is often considered a veritable steal by sophisticated collectors that are taking a more global look at our exciting market. Clearly, a lot more can be said in depth about each of the 4 market forces above. We will be dedicating future blogs to more detailed analysis of each, but we wanted you to have an overview of what we see happening now.